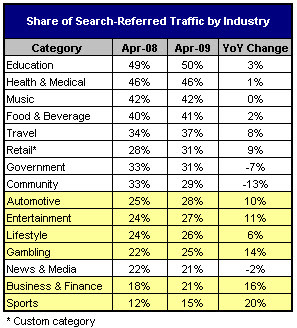 Fortunately the majority of sites we work with in this category are bucking the trend, as most are seeing strong improvements in YoY search engine referral traffic thus far this year. It’s also worth noting that a lot of major publishers still get a huge portion of their traffic from direct navigation. So total natural search engine referral traffic is a more important measuring stick than what percentage of site traffic comes from natural search.